Ever since Google started penalising sites for bad links, link auditing has never been a more important part of your SEO strategy. Over the past year we’ve dealt with and recovered over 40 sites suffering link-based penalties, but audited a lot more. Honestly, audits on this scale just did not happen before link penalties so we’ve had to adapt and refine processes to make it more manageable. How all this came about, Penguins, Pandas and unnatural links have all been dealt with before, so we won’t get bogged down in the details. I wrote about backlink link clean up last year, we still use roughly the same process but have created dedicated tools and refined processes. We’ve also curated an in-house database of over 90,000 manually classified sites such as bad directories, bad article sites and general bad sites that we use as a lookup. You can also download A LOT more linking domains from Google WMT using the Google Download Latest Links button. We’ll hopefully try to provide some deeper insights into the process as a whole. There are a lot of tools that have been created in the wake of the latest penalisations by Google, tools such as Link detective, Rmoov and Link Detox. These tools are great at identifying the most obvious toxic sites and they serve as a great platform to get started, but there will still be a significant portion of links they won’t be able to classify that need auditing. You will rarely pass a manual spam action through using automated tools alone. Concentrate on what’s live (a link checker would help massively here) – but add dead domains you know are spammy to the disavow file. Don’t dive on metrics – don’t use metrics as a guide here, they will just mislead. Link auditing is still very human and very time consuming – Google uses a manual review process for a reason. Classify sites on a domain level – if the domain is bad it doesn’t matter what the link looks like. You will never see all the links to your site – No matter how big the data set you use, GWMT, Majestic, OSE etc. you will never see all of your links. You may need to refresh your dataset if your reconsideration fails. You may also want to read this myth busting link auditing post. After the audit you’ll want to try and reach out to webmasters. This is the part where a good classifications process would help massively. You’ll need to segment your outreach. Potential PR nightmare – some bloggers/site owners can get really upset getting a link removal request for a genuine link or any link for that matter. No-Follow is your friend – for genuine sites ‘linking in a bad way’, request link to be no-followed instead. Quote Google’s guidelines and create a win-win scenario for both parties involved. There is a lot of suspicion over this tool but putting it into perspective, if your site has been penalised whether algorithmically or manually won’t you want to use all tools at your disposal to try to help recover your site? We know the disavow tool works and without it we don’t think some of the sites would have been recoverable as quickly. 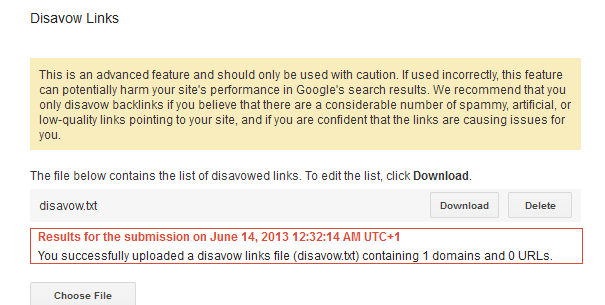 You can get to the disavow file at https://www.google.com/webmasters/tools/disavow-links-main?pli=1. Based on our testing so far here’s what we think. Properly format the disavow file – although this is less relevant now as Google tells you what’s been uploaded. Manual penalty – As a manual penalty is manually audited, we suspect the disavow file is used as a look up to assess whether enough has been done for the site to warrant a clean bill of health from Google. In which case whatever filters have been applied will be lifted. Could this be when the disavow file is activated? If the disavow file has been used extensively and aggressively to rid a manual link penalty, are sites seeing visibility drops due to disavowing equity passing sites? Penguin 2.0 is so flaming new, I feel it’s premature to draw any real conclusions, judging from MozCast and Algoroo, it’s clear whatever Penguin 2 has started…it’s not finished or at least not yet stabilised. While use of the disavow file will, in most cases, aid recovery of a site from a manual penalty, over aggressive use could retrospectively harm the site. Once all the hard work is out of the way and you’re confident you’ve done as much as you can, it’s time to submit a reconsideration request. On a side note, if you suspect your site has suffered some form of penalty but unsure of whether it’s manual or algorithmic, submitting a reconsideration request would be your best way to find out. You can speculate, but why not just go to Google and ask? You can get access to the reconsideration page at http://www.google.com/webmasters/tools/reconsideration?hl=en. If you are ever lucky enough to get an actual email reply from a reconsideration request you’ll probably be given some examples of links. This is where it really pays to have a well-documented audit process as well as someone with experience! The problem is we have had several instances where we had to query Google about some of the examples given resulting in Google changing their stance to revoke the manual penalty. If you get a response from Google, follow up on it. Don’t hesitate to query the example links given if you don’t agree. Reply to their email and keep the subject line intact. We’ve not seen example links that are contained in the disavow file. Google link assessment teams are having a hard time. Matt Cutts has also announced that responses from Google, regarding link violations, will include example links going forward, this can’t come soon enough!